The El Cid Historic District is a U.S. historic district (designated as such on August 31, 1995) located in West Palm Beach, Florida. The district is bounded by Flamingo Drive, South Flagler Drive, Dyer Road and South Dixie Highway. It contains 281 historic buildings. The neighborhood’s proximity to downtown and the western shore of Lake Worth attracted affluent business, political and social leaders who dominated the community’s development in the 1920s and 1930s. The early collapse of the banks in Florida, followed by the Depression, limited further development. After World War II, there was a burst of infill housing construction. Unfortunately, the movement to suburbia in the 1960s diminished the area’s prosperity. But the downturn did not last long. 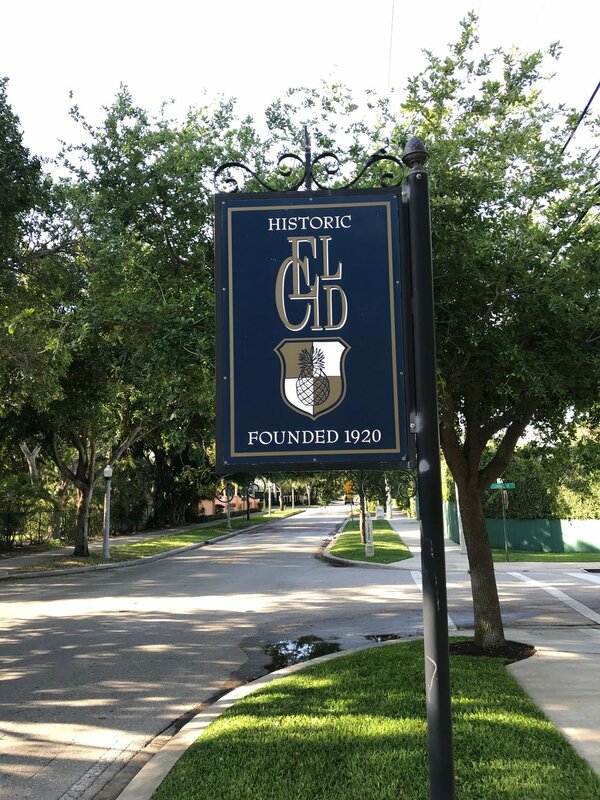 Beginning in the 1980s and continuing until today, El Cid has experienced a rebirth with the renovation and restoration of many of the District’s historic homes. Once again, the neighborhood attracts professionals and business owners proud to call El Cid home. The Community is committed to maintaining its historic authenticity. The El Cid Historic District is listed on the local, State, and National Register of Historic Places. Prospect Park–Southland Park Historic District is a national historic district in West Palm Beach, Florida in Palm Beach County. Including buildings from 1922 to 1945, it is bounded by Lake Worth, S Dixie HWY, Monceaux Rd, and Monroe Dr. It was added to the National Register of Historic Places in 2011. It's nestled between Central Park and El Cid. GRATO - GRATOWPB.COM - Grato's menu offers ingredients of the highest quality and includes made in-house pastas, a variety of rotisserie items, small plates and wood-fired pizza. The Mediterranean design features open airy spaces, large windows, wood, Carrara marble, iron and stoneware (custom pieces handcrafted by local artisan potter Ronald Shaw) to create a welcoming, approachable ambiance. An open kitchen with a wood-fire oven and grill with a large rotisserie to add to the warmth and provide an entertaining focal point. GRANDVIEW MARKET - GRANDVIEWPUBLIC.COM - Grandview Public Market is a culinary experience located within the newly developed Warehouse District in West Palm Beach. Grandview Public is comprised of 14 individual vendors providing unique experiences in shopping and casual dining. Vendors in the Market: CELIS PRODUCE, CLARES, ZIPITOS, CREMA, CRACE'S FINE FOODS, RABBIT COFFEE, THE CORNER, LRT BAR, POKE LAB EATERY. BASQUE AT BIBA - EATDRINKBASQUE.COM - Basque at Biba brings both classic and modern interpretations of Spanish food to Palm Beach County. Hotel Biba, with its rich 89-year history and beautiful tropical courtyard, has a warm, hospitable vibe, making it the ideal setting for Basque's thoughtfully curated food and beverage menu." TABLE 26- TABLE26PALMBEACH.COM - Table 26 Located in the heart of the historical Mango Promenade district and two blocks south of the Norton Museum of Art. Table 26 is a neighborhood restaurant in West Palm Beach with global American cuisine in a sophisticated, casual setting. Executive Chef Amit Jain has created delicious dishes to bring you back to the basics for Lunch, Sunday Brunch, Happy Hour and Dinner. This unique neighborhood eatery has a full-service bar and complimentary valet. KITCHEN - KITCHENPB.COM - Kitchen is a contemporary American Brasserie focusing on passionately prepared, refined and flavorful flare with warm and welcoming service. Passion, discipline and the constant pursuit of excellence ensure high quality food and service at kitchen. Chef Matthew Byrne and his team prepare Contemporary American Cuisine using the highest quality seasonal and local ingredients to create a menu that is approachable yet refined and interesting. JO BISTRO -JOBISTRO.COM - Jo Bistro’s menu created by Executive Chef Joseph Clark was designed to bring delectable healthy food made with superior farm fresh proteins, fruits, and vegetables. Recently added to the menu Acai Bowls, Fresh Juices, Smoothies, and Wraps. Each dish a work of art cooked and plated to perfection. Sushi Jo is next door too for when you need that sushi fix! LYNORA'S - LYNORAS.COM - At Lynoras you will find classic Italian dishes with a modern twist, a blend of new and old world ingredients featuring locally sourced produce and fresh seafood blended with the best of the old world aged Italian cheeses, olives and meats. You are going to love the variety, the fusion of old and new recipes. DIXIE GRILL AND BAR - DIXIEGRILLANDBAR.COM - Dining inside & out. Big menu featuring killer burgers, sandwiches, wraps, salads, pasta, appetizers, daily and nightly specials, even a kids’ menu and dog menu. A full liquor bar & a great variety of craft beers on tap and in bottles – constantly rotating. CHOLO SOY COCINA - CHOLOSOYCOCINA.COM - Feed your senses with a trip to the newest taco shop in town: Cholo Soy Cocina. Borrowing an Ecuadorian slang term for the country’s indigenous people, “Cholo” also means “mixed or ghetto.” It’s a name that reflects an authentic Andean-American food experience that begins before your first delicious bite. CELIS PRODUCE - CELIS-PRODUCE.COM - Delicious organic market. A great place to get smoothies, bowls, and tons of other healthful delights.